In an effort to help, went through a ton of schematics last night looking for any clue as to what that connects to. Because the model year hasn't been mentioned, I took a guess and concentrated on the 94-98 series. 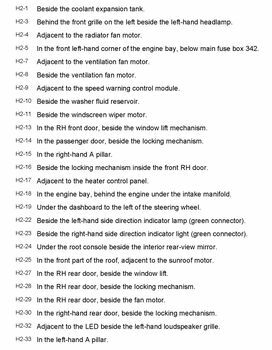 I checked the dwgs for virtually every electrical system in the vehicle. And I can tell you with a fairly high degree of confidence that - at least on the later models - there is no 2 pin connector with a red/white and black pair passing through it. That means anywhere in the vehicle. I never noticed it before but, there are actually very few 2 pin connectors used throughout the entire vehicle. 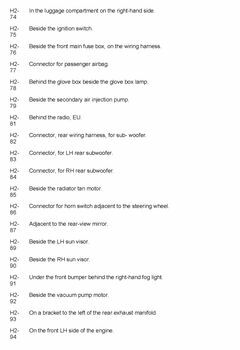 As an example, there are only 62 of those H2 connectors listed below. 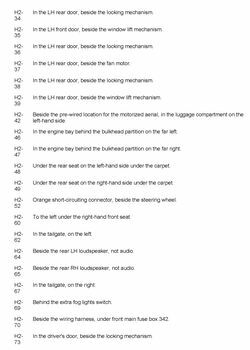 And, about 90% of the H-2's are involved with interior stuff (speakers, courtesy lighting, door locks, power windows, etc) - so there are not that many to check really. But some of those are specific to that vehicle (a 96 CSE - with a turbocharged 2.3, Trionic 5 engine management, Mark IV ABS, non-TCS, etc). The fuel has sit in the car since May 2015 if that helps. Can old fuel lead to the car using so much fuel? I apologize if I'm reading that wrong, but I have to wonder if that same gas is still in the tank. This isn't an issue because the gas is too old, there's nothing wrong with one year old gas. But rather, it makes me think that the reported 8 mpg consumption rate was determined solely on the basis of the readout provided by the trip computer. If the same gas is still in use, it would suggest that the tank hasn't been burned down to near empty, topped off (odometer reading noted), burned down to near empty, tank refilled (odometer read again) and then with this data in hand - fuel consumed vs distance traveled - the true rate of consumption can be calculated. The first step in this diagnostic is to do a physical/mathematical determination of the actual fuel consumption rate - as suggested above. Doing that procedure may show the consumption rate to truly be that high. On the other hand it may not - it might show normal fuel usage. In that case, it would indicate an error in the rate - as reported by the SCC. Either way, someone here can help you figure the problem out - if a problem exists. yeah that fuel consumption figure is meaningless unless it is based on resetting and driving around in normal conditions for some time. if you were getting mileage that bad you would probably see black smoke out exhaust. Old high octane fuel loses its octane rating quite quickly especially if the octane rating is obtained using a lot of ethanol. The engine will run but the knock resistance will be reduced and power output drop. I agree that fresh fuel should be run and a few ranks averaged before keeping to conclusions about actual fuel economy. Odd symptoms imo. Aged fuel 'ain't good' I've found that even over winter stored Gas.. Messes my Shindaiwa Lawn gear Seriously so. A Memorable lesson in fact. The swill runs passably but it leaves a heavy varnish deposit throughout the fuel system, that typically only Elbow grease fully eradicates. Dunno How that would effect mileages unless it's possibly(likely ?) Gummed up the injectors into larger than comanded pulses? Have you pulled the plugs out and are they black with carbon or just done the math, and do you have Traction Control on the vehicle. Traction Control has a button on the dash and uses an Electronic Throttle/ETB. Post a picture of your motor if you are unsure because this sounds to me like a Traction Control limp home mode problem. My 9.3 was the same. Check after driving the cat if its red hot its clog. Easy cheap fix....cut it out straight pipe it or throw a glass pack in its place. It will allow the engine to breathe better. It would be useful if you had a scan tool that could look at fuel trims, provided the car is older than 1996 (obd2).